This project uses high-resolution remote-sensing data from satellite and aerial sensors to measure current biomass carbon and soil carbon levels, and to estimate future carbon sequestration potential. I am trying to answer the questions of how much carbon is actually there now, and how much more can these sites store in the future. The idea is to develop a method that can use some local on-ground measurements along with the latest remote-sensing datasets to produce a fine-scale whole-of-site measurement. This will quantify within-paddock and within-farm variations of current carbon stocks, and will highlight the most productive areas for future carbon projects on these sites. This information will allow land managers to better understand the size of the opportunity to integrate carbon farming within their existing businesses, both as an extra revenue stream and to assist with the climate change mitigation effort. Data fusion of remotely sensed LIDAR, radar, geophysical and multi-spectral and hyper-spectral optical datasets, integrated with field-based measurements, to produce a quantitative carbon model of both the above-ground biomass carbon and soil organic carbon, carbon pools. Local relationships between soil carbon levels in digital soil mapping soil units and remnant vegetation carbon levels will be used to infer the additional carbon sequestration potential of adjacent cleared land units. A general data fusion method and field sampling protocol, along with new quantitative datasets for current carbon stocks and carbon sequestration potential values highlighting prospective locations for carbon sequestration projects. Private land managers such as farmers, graziers and horticulturalists; as well as public land managers such as local, regional and state government agencies. Vetiver (Chrysopogon zizanioides) is a tropical grass that is widely distributed in tropical and subtropical regions of the world. It is a multipurpose grass mainly used for soil and water conservation and land rehabilitation purposes. Due to its massive above and below ground biomass it’s recommended as a potential candidate for soil carbon storage in deep soil profiles. However, there are only few field level studies undertaken thus far. The major aim of this project therefore, is to examine the carbon quantity, nature and distribution in soils under Vetiver grass in comparison with native and Subtropical pastures in Australia and with Coffee in Ethiopia. Carbon is not only a key indicator of soil health, condition and productivity but can also offer a potential mechanism to store carbon for emerging markets as part of the international response to climate change. Soil samples will be taken from under vetiver, native and subtropical adjacent pastures in SE Australia and vetiver and coffee fields in SW Ethiopia. Isotope-ratio mass spectrometry (IRMS) will be used to analyse SOC concentration and δ13C to determine contribution, distribution and process and mechanism of carbon sequestration in 1m soil depth. The information generated will therefore contribute significantly to land management decisions in tropical regions and initiate further investigations on the contributions of tropical grasses as climate change mitigation options. Policy makers, Researchers, Land managers, Farming communities. Biomass-derived black carbon (or Biochar) has gained attention in recent times due to its interactions with soil properties. The study of root-biochar interactions provides an opportunity to study soil architecture, root morphology in rhizosphere, inter-linked with soil C dynamics and microbial responses that may give a new insight into the mechanisms of soil changes resulting from biochar application. study the differential response of biochar(s) regarding soil C dynamics, microbial responses, and gas exchange behaviour in the presence of plant roots to evaluate the potentiality of biochar to mitigate climate change. The study will help to develop a conceptual framework on root-biochar interaction encompassing these related aspects. Researchers, Policy makers, Farming community. Title: Rooting impacts: the role of root distribution and inputs on soil organic carbon. With soil carbon gaining much interest in the last couple of decades, particularly as a potential sink for carbon sequestration, it is vital that we know how much carbon is contributed from various sources and the stability of each source. While the above ground biomass contribution has been widely researched, the below-ground contribution, particularly roots and root inputs, has not been sufficiently investigated. To make better informed decisions about soil health, carbon capture and storage, and soil productivity it is essential to soil carbon science that we account for and better understand the important role roots play in the soil carbon cycle. This research aims to investigate the distribution and components of root contributed soil organic carbon in a pastoral agriculture system. Access seasonal stability of root carbon inputs. Determine the spatial distribution of carbon containing root exudates in the rhizosphere. The information generated will contribute to understanding the whole carbon cycle and the importance of below-ground biomass to the soil organic carbon pool. Researchers, Policy makers, Land managers. Title: Sub-soil microbial processes under rotational cotton crops in Australia. Soil microbial communities contribute significantly to soil organic matter formation, stabilisation and destabilisation, through nutrient cycling and biodegradation. The majority of soil microbial research examines the processes occurring in the top 0 cm to 30 cm of the soil, where organic nutrients are easily accessible. In soils such as Vertosols, the high clay content causes swelling and cracking. When soil cracking is coupled with rain or an irrigation event, a flush of organic nutrients can move down the soil profile, becoming available for subsoil microbial community use and potentially making a significant contribution to nutrient cycling and biodegradation in soils. At present, the mechanisms and rates of soil nutrient turnover (such as carbon, nitrogen and phosphorus) at depth under cotton rotations are mostly speculative and the process-response relationships remain unclear, although they are undoubtedly underpinned by microbial activity. This project aims to determine the contribution and role of soil microbiota to the accumulation, cycling and mineralisation of carbon, nitrogen and phosphorus through the whole root profile under continuous cotton (Gossypium hirsutum) and cotton-maize rotations in regional New South Wales, Australia. The data collected from this project will contribute to our understanding of the microbial processes occurring in cropped vertosol soils, ultimately leading to improved practices. Researchers, Policy makers, crop growers. Title: The significance of dissolved organic carbon (DOC) to deep soil carbon storage. 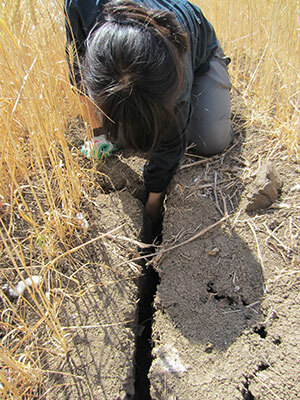 The storage of carbon in soils has recently become the focus of considerable international research attention. Carbon accumulation in surface soils is well documented but very little is known about the mechanisms and processes that result in carbon accumulation and long-term storage in the deeper soil profile (Wilson and Lonergan, 2013). Some recent international research work related to dissolved organic carbon (DOC) dynamics reported that the leaching of DOC is the key mechanism to transport carbon to deeper soil layers and the movement of DOC potentially contributes significantly to the carbon balance of terrestrial ecosystems (Sanderman et al. 2008; Sanderman and Amundson 2009; Rumpel and Kögel-Knabner 2011). But it is still unknown the importance of DOC to vertical distribution of OC pool through the soil profile in different land-use system, management practices and conditions prevalent in Australia. Some work has been undertaken by Soil Carbon Research Programme in Australia and reported only on SOC content and the effects of land-use and management practices on SOC storage but these research works was done only on top soils (0-30 cm depth) instead of deep soil. The principal questions of this research therefore is: what is the relative significance of DOC to carbon input in deep soil layers and how the quantities of carbon differ on different land-use systems in NSW, Australia? Soil samples will be collected from three different land-use systems (woodland, pasture and cropland) at 0-1.0 m depth from northern NSW selected from the Statewide soil monitoring program network of sites. The work will be undertaken using a range of techniques including SOC quantification and analysis, δ13C and 14C isotope analysis. investigation of DOC in different land-use systems will gain new insight into the mechanisms and importance of DOC in the soil carbon cycle in Australian soils. The work will therefore significantly extend our knowledge of soil carbon dynamics and the potential for soils to be managed to store additional, long-lasting stocks of carbon as a response to climate change. Results will contribute much to the currently limited quantitative understanding of C fluxes resulting from C input, transport and stabilization processes in Australia. 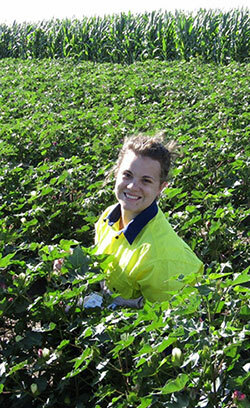 Title: Mechanisms of whole-profile C and N cycling under rotational cotton in Australia. Previous research within the cotton industry has demonstrated the potential of some systems (e.g. cotton-maize) to increase C and N contents, particularly in the deep soil profile. This has considerable significance for C and N cycling and nutrient supply for cotton production. A comprehensive understanding of the quantities and mechanisms of C and N distribution, mineralisation and turnover through the whole-profile under cotton-maize and comparable cotton rotations will enable these cycles to be fully predicted and managed, with added benefit of quantifying the potential contribution to and mitigation of greenhouse gas emissions. Together, these will enable us to identify the best management practice that maximises resource use efficiency while reducing environmental footprints, thereby ensuring the economic and environmental sustainability of the cotton industry under more stringent carbon-accounting regulations. mineralisation, turnover and rates of C and N cycling down the profile. The information generated will contribute to the mechanistic understanding of the whole-profile C and N cycling under various cotton rotations to identify the best management practice to maximise long-term C and N capture for improved nutrient management and climate mitigation. A limitation to current estimation and modelling of carbon is the availability of reliable, ground-validated data and modelled relationships between environmental factors and the quantities of carbon that are currently stored and potentially stored in biomass and soils (i.e. CSP). It is clear that rainfall dominates the above ground biomass (AGB) and soil organic carbon (SOC) distribution at large scales. However, a better understanding of the local-scale interactions between the two pools is needed to ensure CSP estimates are applicable for within-paddock estimation. This project seeks to unravel these relationships across NSW landscapes to more clearly quantify and define functional relationships between key environmental factors (climate, topography, vegetation, soil type etc.). The proposed post-doc will enhance our fundamental understanding of these relationships and mechanisms, will augment and strengthen existing data layers relating to carbon storage potential and will provide a robust basis for estimation and quantification of carbon storage in diverse landscapes of NSW to enable participation in carbon markets with a high degree of certainty. 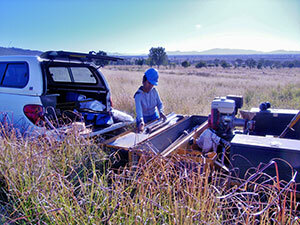 describe/define the local soil and vegetation with remotely-sensed measurements. The functional relationships that will be identified and refined in this post-doctoral project are expected to improve the assignment of carbon values to the classes within the CRCSI project by associating measured variations in carbon stocks with vegetation type changes, diverse vegetation structures, soil type and climate variables. In practical terms, it is expected that this will result in narrower carbon ranges within each of the final carbon classes, with reduced uncertainty.